I turned 40 this week. The Big 4-0. It still sounds weird to me when I hear myself say it out loud: “I’m 40.” Nonetheless, the proof is there – in the date on my license, the “laugh lines” on my face and the grey hairs, and the experiences of my life. As I approached the big birthday I found myself contemplating age and aging. I’ve never really had a good role model for how to “act your age.” A couple years shy of 80, my dad still skis most days in the winter, hikes with the grandkids in summer, and acts as his own general contractor and head carpenter for a happily endless array of house projects. I’m likely to find my mom, a good bit younger than my dad, but still considered a “senior,” outside sledding with the children or digging in the garden, rather than tucked quietly into a grandmotherly rocker. So hitting a new decade mark has me a bit bewildered. How is a 40-year-old supposed to act? Where in my life should I be at this age? How the heck did I get to 40, when I feel like I was 27 just last week? When you’re a teenager, it feels like reaching 18, then 21, will take forever. At 21, 30 seems distant. At 30, the beginning of a new decade may still be a personal shock, but your 20s were just a few months ago. And then, suddenly it seems, the 20s are in the distant past, and you’re in the midst of middle age. In the last few weeks, I’ve read articles and blog posts about aging gracefully, coming to terms with turning 40, things older people regret doing – or not doing – during their youth, and things you can do at 40 that you couldn’t at 20. All a bunch of hogwash, really. Here’s how I look at it: there are certain things we can do now, at whatever age we are, that we couldn’t do 5 years ago or 20 years ago or last week. And there are things we could do then that we can’t do now. Most of it is not directly tied to age, but rather to perspective and experience. When I was in my 20s, I could ride my mountain bike for long periods of time, at high elevations, without collapsing. That’s because I used to ride my mountain bike a lot, and I lived in a town whose elevation was 9,000 feet above sea level. I have friends, my age and older, who can still do that, because they ride bikes a lot and are bad asses. Me, not so much. But today I can do a handstand in yoga class, because it’s something I’ve practiced. I can run five miles without getting too tired or too bored. I can be perfectly content sitting at home with a glass of wine and a good book on a Saturday night. I also get more done most days before 7:30 a.m. than I used to in an entire week. That is a simple necessity when managing three children, a house, a small menagerie of furry pets, and professional responsibilities. Would I trade 40 for 20? Nope. 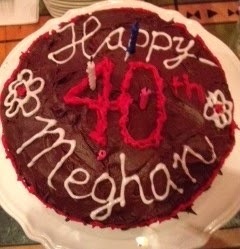 Just as when I was 20 I wouldn’t have dreamed of fast forwarding two decades to 40. There are certainly things I miss about those younger days – being able to walk down to the bar just to see if there was anything interesting going on, sleeping late on days off from work, skiing endless powder runs without worrying about collecting kids from their ski lessons, and – perhaps this one most of all – having the freedom to hop in the car and head out of town for a weeks-long road trip, or deciding on a whim to move to a different country for six months. That was all fun stuff, and I’m really glad I did it. There are good stories in those experiences, and a few bad ones, too. They all make up the wandering road of my life to this point. I’m also really happy with where I am now. I think if I were still road tripping around, solo, I’d be pretty bummed. Even back then I knew I wanted to settle down sometime, have kids, do good work. And that’s where 40 finds me. So here’s my birthday epiphany for the year I hit the Big 4-0: however old you are, embrace life. Whatever your age, do the best you can at whatever it is you’re doing. Hopefully it’s something you want to be doing, somewhere you want to be. That way, when you look back, you’ll have fond memories instead of regrets. And when you look forward, you’ll have some idea of where you want to be going, even if you’re surprised when that next big birthday sneaks up on you. Original content by Meghan McCarthyMcPhaul and posted to her Blog: Writings From A Full Life. This essay also appears as Meghan's Close to Home column in the January 24, 2014 edition of the Littleton Record. When I brought Fiona home from a pet store in Grand Junction, Colorado, she easily fit into one of my hands. 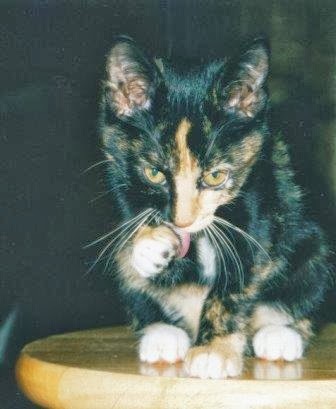 She was the first pet who was all my own, a tiny, impossibly soft tortoise shell kitten who soon proved to embrace a Dr. Jekyll and Mr. Hyde persona – all contented, fluffy purring one minute and hissing, biting fur ball the next. She was the wildest baby anything I’d ever seen, a little hellion of a calico, and she stayed that way from kittenhood through old age. She scratched the couch and chewed on photographs and believed – as cats seem to – that the world revolved around her. She was also an incredible jumper, an expert climber, a fierce mouser, and loving toward those – human or otherwise – she considered worthy of her affections. A few days after bringing Fi home, I returned from work to find her atop the refrigerator. How that tiny cat managed to climb up there I’ve never been able to figure, but there she sat, mewing and shivering in the high corner of the kitchen. I lived alone then, and for sport, Fiona would crouch behind doorways and attack at unexpected moments, hurling her little fuzz ball self through the air and attaching to my leg, claws and all. As soon as Fiona was big enough to go out, she embarked on a long career of hunting. The first time she brought me a dead bird, I put a bell on her collar. She used to climb to the top of a five-foot high post in the backyard and sit next to an old bird feeder there. The feeder hadn’t held birdseed for many years, but from her perch, Fi could survey her domain. She mostly left the birds alone, but she hunted small rodents, even bringing home two bats late one night, leaving one next to my bed and the other in the bathroom, where my roommate had the misfortune of finding it on a predawn trip down the hall. We closed the cat door at night after that. Once Fi and I finally settled into an old house in a New Hampshire field, her mousing skills were valuable in catching the critters who came in from the cold and wanted to cohabitate with us. Even in her later years, as she grew skinny with diminishing health and deaf with old age, Fi maintained a hunters’ heart. She drove herself nuts sitting in the large picture window of the living room and watching the chickadees flit from lilac bush to feeder and back. Her tail would twitch, just at the very tip, perhaps with anticipation, perhaps with memories of younger, wilder days. Fi stuck with me through many years and all the changes time brings – several moves, new jobs, a couple of broken hearts, and a changing cast of feline, canine, and human characters. She forgave me, eventually, when I left her with my roommates and took off to Ireland for six months. She huddled amongst all my worldly belongings, which I crammed into the back of my Subaru when I returned from Ireland and decided to move back East, barely budging on the days-long journey from Crested Butte to Franconia. She loved me even after I subjected her to a few months of living with my mother’s cat, who was normally lovely, but stalked Fiona with a murderous vengeance, and my parents’ German shepherd mix who was as schizophrenic at Fiona and regularly tried to eat her. She stuck with me when I brought home another kitten, then a man, then a golden retriever (whom Fiona regularly tormented), and, finally, three small human children, who demanded my constant attention and made lots of noise. While Feargus, the kitten who grew into an immensely plump, easygoing cat, allowed the children to pull on his tail, pick him up, and lie all over him, Fiona wanted nothing to do with the kids for a long time. She hissed at them regularly, glared in a way only a cat can do, and drew blood from each at least once. But Fi had a gentler side, too. She took care of Feargus like he was her own kitten. Even after he grew to twice her size, Fiona would clean him and settle him down with a firm swat when he got out of hand. She loved to crawl under the covers and curl up by my side, purring away as I read the latest book on the nightstand. She immediately adopted my husband, who does not particularly care for cats, as her own human, usually preferring his lap to mine. And in her old age, she mellowed considerably. A thyroid issue caused her to steadily shrink until she was a mere wisp of her former rotund self. But as she grew older and thinner, she seemed to also become content. She still ran around chasing toys and flies and whatever else was there to chase, and she terrorized the poor, gentle dog until her final days. But she would curl up on the couch with the kids at any chance, poking them gently with a dainty paw until they pet her. She even allowed stroking by my mother, a cat lover who was perplexed – and vexed – for years by Fiona’s apparent disdain of her. She purred all the time in her last months. Near the end of last week, feisty Fi really slowed down, and by Saturday it was clear things were not right. So on Sunday, when she looked at me sadly from tired eyes and refused even to purr, I knew it was time, after nearly 16 years, to let her go. Anyone who has ever had to make the decision to euthanize a beloved pet knows the sinking feeling of that choice. It was a sad decision, but not a hard one. After a good life, and with the help of a kind vet, Fiona’s passing was blessedly quick. I miss her and her crazy ways, but I know that little hellion of a calico will stay in my heart forever. Original content posted by Meghan McCarthy McPhaul to her Blog: Writings From A Full Life. It’s been said that home is where your heart is. If that is true, I have many homes, for I have left bits of my heart in the mountains of Colorado, with the stark landscape and ever-present sea of the west of Ireland, and in the familiar rooms and winding staircase of the dormered cape house that was my childhood home. When I moved back to New England after nearly a decade of living other places, I figured I’d settle down in a largish town, with plenty of people and job opportunities and things to do. I ended up finding all the people, opportunities, and fun I needed right here in Franconia. I guess I’m just a small town girl. 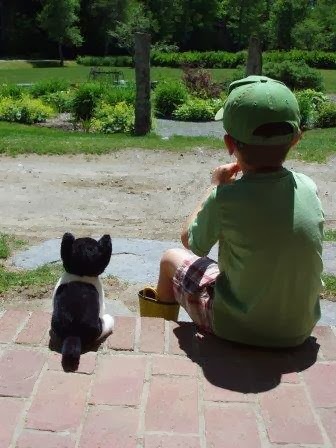 So, I understood the other day when a friend, recently relocated to small town New Hampshire from big city New York, remarked on how much she loved life in her new community – and how surprised she was by her contentment at small town living. That conversation involved a couple of other recent big town transplants, who talked about how little they miss the mall – where you’re likely to spend too much time and too much money buying things you don’t need anyway – or the traffic, the keeping-up-with-the-Joneses, even the anonymity of living in a bigger place. Many people, of course, thrive in big cities and love the world of lights and noise and museums and galleries and the myriad other conveniences and luxuries so easily accessible in metropolitan areas. One of the many beauties of New England, though, is that wherever you live, a journey of a mere few hours can bring you to the mountains or the ocean, a city or a small town, hustle and bustle or peace and quiet. It’s a little bit like having it all. I have friends who have grown up here and never left, some who moved away and came back, and others who, like me, arrived from somewhere else. While I grew up skiing at Cannon Mountain, have lived here full time for a dozen years, and married a local boy, I have no illusion of being a true local. I’m a transplant from Massachusetts, and I’m OK with that. For hundreds of years, people have been coming from “someplace else” to the White Mountains in search of home. They’ve come for the mountains and the relative solitude they offer, to seek adventure, for the fresh air and cool rivers and quiet fields and forests, for the love of another person, sometimes for jobs, often to find a simpler way of life – to build a way of living that matters. For me, coming home to New England after years away meant returning to a familiar place and again being surrounded by family. I didn’t fully appreciate that latter bit until I had children of my own. Those children are growing up with aunts and uncles and grandparents literally right around the corner or just down the road. Whichever way we turn out of the driveway, we’re heading toward family. Once I flew the coop of my own childhood home, it took having children to root me to any place so firmly again. I want my children to have a good sense of home, too, even if this is not home to them forever. And so I have set aside my wanderlusting ways and put down roots, anchoring me to this place, this home, even as my heart sometimes soars with my imagination to other places. Home, now, is at our dining room table, the same table where I sat as a little girl with my parents and brothers – and where I sit now with my children, cats and dog underfoot, the room filled with the wonderfully unpredictable (and sometimes outrageously exasperating) conversation of children. Home is the backyard vegetable garden, hands stuck into dirt, sun or rain upon my back. Home is the mountains where I grew up skiing and hiking and which my children now explore. Home is in the embrace of those children, my husband, my parents, our family. How lucky I am to be at home here, where my heart is. Original content by Meghan McCarthy McPhaul and posted to her blog: Writings from a full life. This essay also appears as Meghan's CLOSE TO HOME column in the January 10, 2014 edition of the Littleton Record.